Bonaventure. Orange Line. Opened 1967. 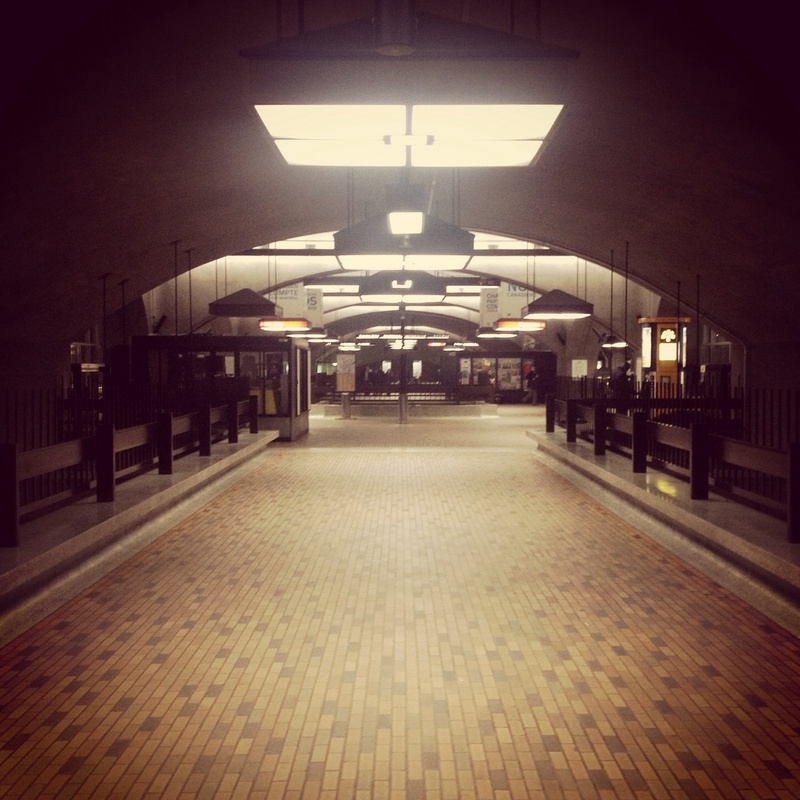 Montreal’s main railway station, Gare Centrale, is a sunken, disorientating space somewhere below the downtown skyscrapers and is accessed through Bonaventure metro. To take this as a metaphor for the moves towards the confederation of Canada in the late 1850s, culminating in the British North America Act of 1867, would be something of a stretch. To say that Canada was born with the railways would be to emerge from that disorientating space with nothing that is not already known. More disconcerting is the idea it was Canada that followed the railways, not the other way round. That George-Etienne Cartier, co-premier from Canada East, modern Quebec, and Alexander Galt, the Province of Canada’s finance secretary, both “fathers of Confederation”, were heavily involved in the Grand Trunk is well known – Cartier was the firm’s lawyer, Galt a director. What Smith explores is the more distant role of played by bankers and aristocrats in London whose fortunes depended on the survival of Canada’s railways. Among these were the Colonial Minister, Henry Pelham-Clinton, the Duke of Newcastle, and the firm’s main banker, Thomas Baring, whose firm had wielded considerable influence in the negotiation of a post-Napoleonic settlement at the Congress of Vienna and had raised the cash for the United States’ purchase of Louisiana. Opposing these men, or at least indifferent to their plight, were manufacturers and exporters in both Canada and Britain. Free trade, introduced in the 1840s, meant that in Britain they enjoyed little profit from the empire and saw the huge sums spent on Canada’s railways as a way of lining only the pockets of aristocrats and financiers, like Newcastle and Baring, and the providers of professional services in Canada, like Cartier. In Britain, this caused differences between Manchester manufacturers, whose staple import, cotton, came from the US, and London bankers and put the Duke of Newcastle at loggerheads with Gladstone over competing visions of empire, Newcastle favouring imperially-financed infrastructure, Gladstone, an association of self-sustaining colonies. Memorably, the Manchester cotton manufacturer, Richard Cobden, described the 3 kilometre-long Victoria Bridge, opened Montreal in 1860 to serve the Grand Truck, as “a splendid monument of engineering and wasted capital”. Given this one would not have wished to have been Alexander Galt meeting Manchester City Council three years after he had increased the tariffs on importing goods into Canada. Still, thanks to railway interests on the Council, Manchester supported Confederation in 1864. This presumably pleased the Duke of Newcastle who felt that he could not pursue union in opposition to fellow cabinet ministers and the manufacturing interests of Britain. For Newcastle and his faction, the union proposed by Galt would ensure continued access to favourable terms in London’s credit markets, not least for expansion and a transcontinental line, until the railways turned a profit. Put in more up to date language, for these men, the railways were too big to fail and the answer to their difficulties was the creation of a gigantic shell company by the name of Canada. As I am still reading Smith’s book I cannot say if he takes his thesis to this extreme. Other factors were clearly at play, not least the representative imbalances caused by population growth in modern Ontario, its hostility to Catholicism in modern Quebec, and the American Civil War. Yet, these too lent themselves to the calculations of the railwaymen, their financiers, and politicians in London: the collapse of the Province of Canada would make expansion and borrowing that much more difficult; when it looked likely that Britain might go to war against the Yankees, the lack of a good railway from Halifax delayed troop movements considered urgent in the heat of crisis. Regardless of how far Smith pushes his thesis, he has pushed the form of an academic book on Confederation into the terrain of “Follow the money”. The result is both informative and thrilling. Posted in Orange Line. Tagged British Empire, Gare Centrale. Next: Next post: Jean Talon, How Do You Like Them Apples?